Thank you very much to all who support my art production in many ways over many years. As you can see, new works are on their way into the collection from my painting studio. Of course, this wonderful studio competes with my far removed high-tech digital studio, 29 steps away. But, fortunately they are very compatible, bringing new energy daily to each other. Frank thinks back, “Decades ago, I hiked down into the Feather River Canyon with my daughter Gracy to explore a hidden treasure I had discovered off the beaten path. You could hear it before you saw it…a thirty foot waterfall, flowing into a beautiful lagoon. Not too long after that visit, I began to do a painting of this magical place. Over the years, I’ve found opportunities to do a bit more work on the picture, including a couple of parrots known to travel the canyon…escapees from pet owners. These paintings are part of a gallery series ( click here ). The work by Frank Kliewer is licensed under a Creative Commons Attribution-Noncommercial-No Derivative Works 3.0 United States License. We were blessed a few days ago with a message from a special contributor to arrive at a time we are all moving forward with our work for this year. We want to share the words she attached to her message…the words of Mother Teresa. Today’s post features a painting hanging in the Art and Zen Sanctuary. This work is painted in acrylic on a hand-crafted custom wood panel, painted around the 1.75″ edges and measuring 96” x 24” with rounded corners. This art is now employed as a mirror imaged background for the composite header now at the top of each page, along with our enlightenment frog sitting as a guide. The significance of the lotus flower in the Zen tradition is about beauty rising out of the muck where it grows. This is similar to freeing our minds through meditation, rising above the mess around us in the world today. Bless you all as you deal with task of finding the best space to elevate your consciousness. A planet, a person, a life. For fame and immortality, for hope. We would find our place in infinity. Our vow: Be where we are, require nothing…accept everything. Easier said than done, but keep at trying, that is all we can do. As we mark the passage of the old year and look forward to new horizons, it might be worthwhile to take a look back at our past and consider how quickly a moment passes. 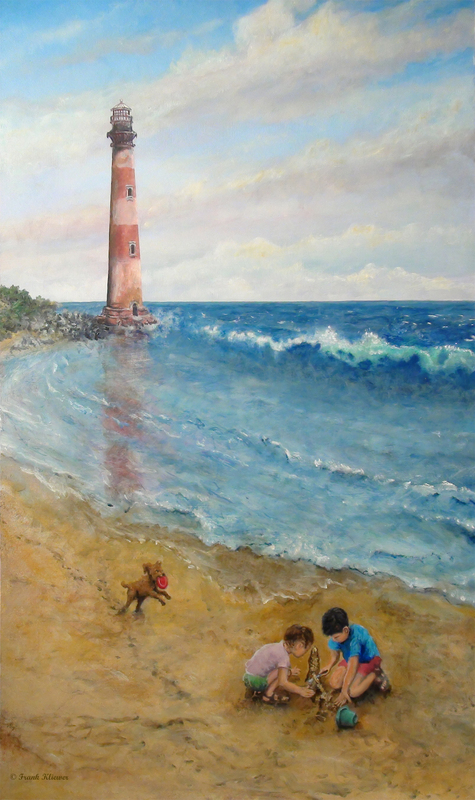 Frank’s portrayal of his grandchildren a decade ago, playing in the sand, is incorporated into this 18″ x 30″ acrylic on wood painting “Sand Castles.” Also featured is the Old Charleston (Morris Island) lighthouse, built in 1876. It is the third tower to occupy that space, the first built in 1767. His grandson is now in the U.S. Air Force and will complete basic training next month. His granddaughter will be graduating high school in two years. The poignancy of this fleeting moment of childhood is echoed in the old tower, with its outdated technology and the encroaching sea. And yet it still stands, proud, battered, the stories of lives redeemed written in every brick. We can choose to look back with sorrow and regret or move on with indifference and thoughtlessness. Or we can bless the moment and then let it go. It is our choice. We follow our lights as we can. We wish you peace and joy in 2014. Thank you for visiting this site.